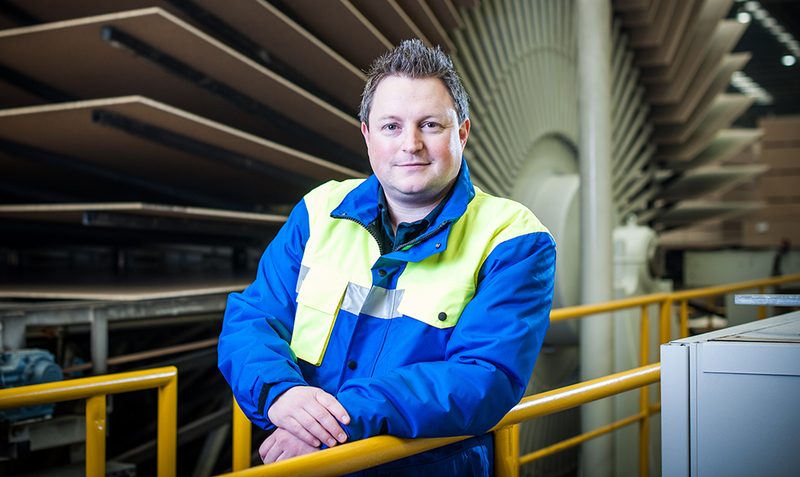 In this edition of our Engineering Industry updates, Director Karen Stewart, chats to Heiko Lichtblau, Plant Director Technical/Production at EGGER’s Auchinleck plant. Heiko started with EGGER on a university placement back in 2006. He returned in 2007 as assistant to the Technical Director and has since progressed to Production Manager before being promoted to Plant Director Technical/Production in 2016. Heiko, you have recently expanded the engineering department. What has driven this need? The ongoing investment at EGGER (UK) Limited is a direct result of it being a family-owned firm committed to making multi-million pound investments for the long-term future of the business. This approach has seen a consistent increase in production, growth in market share and an increase in turnover. As a result we needed to expand and re-organise the engineering department at our Ayrshire plant. In the UK, where are EGGER company headquarters and how many people are directly employed in the UK and in Scotland? EGGER (UK) Limited has two manufacturing plants, its headquarters are at Hexham in Northumberland, where we have been operating since 1984. Our business has gone from strength to strength, which is underlined by our increasing numbers of employees. We now directly employ 783 people in the UK across a range of different disciplines, ranging from production, engineering, sales and marketing, customer services and forestry. We directly employ 122 people at our Auchinleck plant in Ayrshire, which has been operating since 1997 and are the largest manufacturing employer in Northumberland. For me, one of the best things about EGGER is that it is a family business with a friendly and welcoming atmosphere. I also value the team ethos, It is very important that we work together, not just with the UK plants but throughout the Group. This is supported by the flat managerial structure: EGGER is one of the only employers that I know with such an open door policy. Looking at the market for EGGER UK’s products and services, what are its key sectors? EGGER (UK) Limited is part of the EGGER Group, a leading wood-based materials manufacturer. As a market leader we produce an extensive product range of wood-based materials (chipboards, OSB and MDF boards) as well as sawn timber. We have 17 plants across Europe, 24 sales offices around the world and a worldwide customer base. As such, we are a full-range supplier for the furniture industry, interior design, wood construction and wood-based flooring (laminate, cork, and design flooring) industries. In terms of that market, where does EGGER (UK) Limited position itself, in view of its long heritage in Britain, and with what types of recent project has it been involved? EGGER is a market leader in the UK. We sell our products directly to customers and through distributors. As a leading international wood-based materials manufacturer, we produce a wide range of products found throughout your everyday life and feature in a range of applications, including: cupboards and doors in kitchens; wardrobes and units in bedrooms; desks and drawers in offices; furniture and wall paneling in hotels; counters and shelving in shops and structural flooring in the house-building industry. This month has also seen us launch two new EGGER Decorative Collections – an international collection for architects, interior designers and fabricators and a second collection specifically compiled for the UK and Ireland furniture manufacturing industry. They are the most comprehensive we have ever launched on the market and replace what was previously known as the Zoom collection. With new decors and textures, these collections are our answer to fast trends, the increasing complexity of product ranges, and the shortening shelf-life of products. It’s pretty amazing to think that in the 30+ years EGGER has been manufacturing in the UK we have produced enough melamine faced board to build one and a half kitchens in every home in the UK and made enough tongue and groove to floor more than two million homes. Our products have been specified in a range of projects including: The German Pavilion at Expo Milano, 21 million visitors came to the Expo Milano of which three million experience the German Pavilion. Other projects include Hotel Indigo, this is part of the IHG Group global hotel group, which has more guest rooms than any other hotel group in the world. Closer to home our products have been specified in Glasgow student accommodation and in the Edinburgh Marriott Residence Inn. What career opportunities are there in the business? EGGER is a great place to work and with a wide range of interesting and varied roles, there are plenty of opportunities for you to develop your career in our multi-award-winning company. Our ongoing successful development is underpinned by significant levels of investment in our plants, processes, technology and people. At our two UK plants over £250m has been invested in the last decade. This means whether you are an apprentice, graduate or a skilled employee you’ll be working at some of the most technologically advanced chipboard plants in the world. At EGGER you are always learning and along with comprehensive apprenticeship and graduate programmes our international award-winning Group-wide internal training programme ‘Kompakt’ ensures everyone, regardless of their discipline, has a comprehensive understanding of the business. The nine training sessions are delivered by in-house experts and focus on the core areas of our business which ranges from production, engineering and logistics to products and marketing. If you are looking for more information or considering looking for a new role within the Engineering & Manufacturing space, contact Karen Stewart today on kstewart@weareninetwenty.com or call the Nine Twenty office on 0141 231 1260.